PERFORMANCE EXHAUST - PAN ROOF - BURMESTER SOUND SYSTEM - FULL MERCEDES SERVICE HISTORY!!! Finished In Iridium Silver Metallic With Black Nappa Leather And Contrast Designo Red Diamond Stitching. Only 18,000 Miles and A Complete Mercedes Benz Service History Including A Major Service From Mercedes Macclesfield In June 2018. 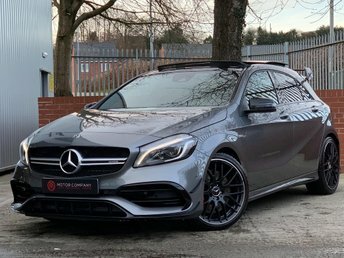 An Out Of The Box Example With Options Including: AMG Red Pepper Carbon Trim, 19' AMG Forged Cross-Spoke Black Alloy Wheels with Red Rim Flange, Panoramic Electric Sunroof, Burmester Surround Sound System, Performance Exhaust, COMAND Online System, Reversing Camera, Satellite Navigation with 3D Map Display, Automatic Climate Control, Cruise Control, DAB Digital Radio, Parktronic with Active Park Assist, Drivers and Front Passenger Seats - Electrically Adjustable, Heated And Memory Function, Keyless - Go Comfort Package (Keyless Start, Keyless Entry, Hands-Free Access and Automatic Boot Closing), Privacy Glass. 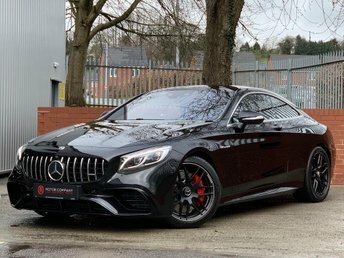 An Exceptional Example Of The Iconic C63 Edition 1. Please Call or Email To Discuss., 3 owners, 5 seats, FREE NATIONWIDE DELIVERY - 5.4% APR FINANCE AVAILABLE - 12 MONTHS WARRANTY!! !